School leaders also participate in remembering 17 students slain in Florida. Students across the U.S. left their classrooms for 17 minutes Wednesday to remember the 17 victims killed a month ago at Marjory Stoneman Douglas High School in Parkland, FL, and to draw attention to gun violence on school campuses. By this week, more than 3,100 walkouts across the country were registered on the #ENOUGH National School Walkout site hosted by the Women’s March. These included several sites participating in Europe and Australia, as well, with each starting the walkout at 10 a.m. in their respective time zones. At T.C. 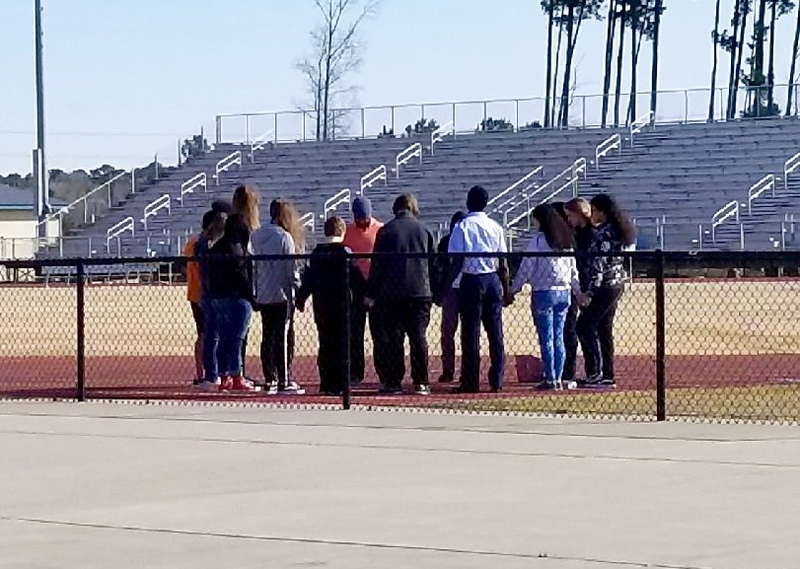 Williams High School in Alexandria, VA, students filed out of the doors of the school and walked to the football field, where they recited a chant and held a moment of silence. Press, parents and members of the community were required to remain on the sidewalk off school property, and a few cars blew horns as they drove by. "He wants to make a difference," said Carrie Fairmon, who arrived at the school before the walkout to bring her 11th grade son a poster that read, "I want to learn in a safe place." "Very proud of our students," Reno (NV) High School Principal Kris Hackbusch wrote in an email. Students there observed 17 seconds of silence and "wrote positive messages on a banner we will mail to Stoneman Douglas High School," he said. Meanwhile, members of Congress held a hearing Monday seeking answers to why the FBI did not act on warnings about Parkland shooter Nikolas Cruz. In the weeks leading up to the walkout, some schools announced that there would be no negative consequences for students who participated, while others warned that students would face suspension. Some colleges and universities shared messages of support for students and said that being punished for participating in the walkout would not hurt college-bound seniors’ chances of admission. A student holds a sign outside Orchard Collegiate Academy on Manhattan's Lower East Side. The American Civil Liberties Union affiliates in some states also urged district leaders not to enforce any harsher punishments on students than they would if they missed class for any other reason. 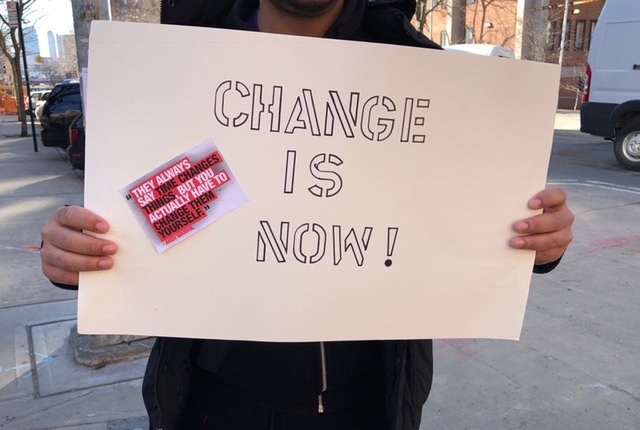 When students walked out of school in September in places such as Denver and Phoenix to protest President Donald Trump’s decision to end the Deferred Action for Childhood Arrivals program, many received unexcused absences. "Today’s events are an extension of more than 120 years of youth-led activism in the U.S.," said Adam Fletcher, the founder of SoundOut — a nonprofit organization that works with schools to increase student voice — and the author of "Student Voice Revolution: The Meaningful Student Involvement Handbook." "Seeing individual teachers, building leaders and local school boards stand in support of their students is a great thing, and shows their commitment to democracy. The next challenge is for educators to create sustained opportunities for student voice throughout schools on every issue students are impassioned about, and not just ones adults agree should matter." 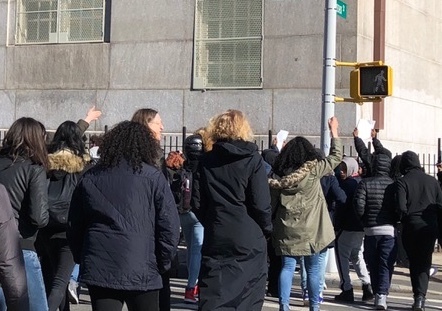 Students from the Seward Park Campus, which includes five high schools on the Lower East Side of Manhattan, participate in Wednesday's walkout. Goncharuk says he felt moved to organize a walkout at his school because of the connection he felt with the Parkland, FL, students. As Wednesday grew closer, more schools began to give students orderly ways to participate in the walkout and express themselves while still discouraging them from leaving their school grounds. Some schools are giving students a place to write messages, gather on their school’s football field, or begin the process of registering to vote. A huge crowd gathered for the walkout planned at David Douglas High School in Portland, OR. "Students brought posters and some chanted on the football field, and there was time for silence," says Zachariah Sippy, who attends Henry Clay High School in Lexington, KY. "The admin and teachers were generally helpful and supportive, allowing for students to exit and reenter the building safely, even making a PA announcement at 9:55 a.m."
Wednesday’s walkout wasn’t the only event planned in response to the Feb. 14 shooting. March for Our Lives is being held in Washington on March 24 — not a school day — as well as in hundreds of additional sites across the country. The event has drawn donations and led to benefit concerts the night before and support from celebrities. Kate Lebrun, a senior at Walter Johnson High School in Bethesda, MD, worked with friends to organize Walter Johnson Students Against Gun Violence after bomb threats were made at her school on Feb. 21. They created a hosting network for students traveling to DC for the March 24th event. So far, they’ve lined up 300 host families offering about 700 spots and have placed about 230 students. Her school is also hosting a potluck meal the night before the march. A third event on April 20, also called the National School Walkout, will observe the 19th anniversary of the shooting at Columbine High School in Colorado, in which 13 people were killed. So far, 1,650 demonstrations are scheduled that day. A group of students at Rocky Mount (NC) High School form a prayer circle on the football field during the 17-minute protest. Amelia Harper and Lauren Barack contributed to this report.